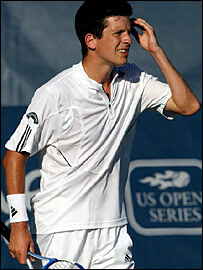 Tim Henman suffered a shock first-round exit against American wildcard John Isner at the Legg Mason Classic. The British number two hit five double faults as he lost 4-6 6-4 7-6 (7-4) in Washington to the 22-year-old, who is ranked a lowly 416th in the world. Henman saved two match points in the 10th game of the final set but found himself 6-3 down in the tie-break. He clawed another match point back but then double faulted to end the match after just over two hours on court. Henman, 32, who won the Washington title in 2003, said: "I don't feel there is anything wrong with my game. It's just disappointing to lose. Can Henman still salvage something from this season? "To come up short is always frustrating. It's tough when you lose by just a few points to a guy of that nature. "You just have to give yourself more opportunities in the future." Isner, the world number 416, won for the first time at ATP Tour level, and he now faces German eighth seed Benjamin Becker in the second round. "I might have caught him on an off day," he said. "To come up with a win against a player like Tim is awesome. It's kind of surreal for me, like a dream come true." Henman has had a poor season to date, the highlight being his epic first-round win over Carlos Moya at Wimbledon. He is playing doubles with India's Mahesh Bhupathi this week in order to gain match practice. The pair won their first match on Monday. In other matches on Tuesday, top seed Andy Roddick opened his campaign with a 6-4 6-2 win over Tomas Zib in the second round. "I was hitting aces and when I was hitting good first serves they weren't coming back," said Roddick. "I was really pleased with my serve tonight." Third seed Marat Safin beat Jan Hernych 6-2 2-6 6-2.